Member of Whiting Hacklefarms Pro Team, Regal Engineering Pro Team and member of Catskill Fly Tyers Guild. I live in Sollefteå, right in the middle of Sweden. I’ve tied flies since I was 13 years old( will be 50 this year 2015). My fishing is mostly for Brown trout and Grayling, so the flies I tie are for those species. I’m interested in the fly fishing history, all the old fly patterns, fly tiers and and great fly fisherman. The Catskill mountains, NY, has a special place in my heart. Been there 2 times, met some great people, fished the Beaverkill and Willowemok and have been a guest fly tier at the Catskill Fly Fishing Center & Museum. I’ve been a fly tier at several Swedish angling shows. 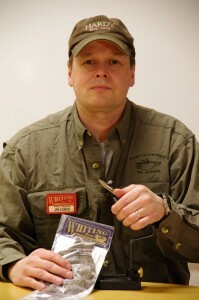 I and 9 of my fly tying friends from Sweden, were attending the Sommerseth Fly Tying Show a few years ago. I hope to return. A dryfly on the leader, a bamboo rod and a nice river, that makes my day! Why Daiichi: I tie and fish mostly with dry flies and North Country flies and I find the Daiichi hooks are perfect for that. Daiichi hooks come in a lot of different models that suits my fly tying/fishing and I have to say, “If you’re looking for high quality hooks….Daiichi will be you’re choice!”.